You are here: Home / Newcomers / What You’ve Been Missing In The Calgary Public Library? As a newcomer, you are opening a new chapter, a whole new book filled with unwritten pages. When I arrived in Canada, I have the urge to know a lot of things more than ever. Not as much when I was studying in college and looking for a job. Are you having an overwhelming surge of information that you don’t know where to start? Take a pause. Before you scour the internet and search something like “becoming a successful newcomer to Canada” and anything relevant to help you start on the right track, make a trip to the hub of learning—The Calgary Public Library. This is your first stop for that insatiable desire for knowledge and whenever you feel like you are on a dead end, having exhausted all the means in search for enlightenment. Needless to say, I advocate the habit of reading. If there is one thing I can give an advice to a newcomer, that is, visiting any of the 18 Calgary Public Libraries. Still not convince? Read along and you’ll know that I’m not talking about and, for the most part, trying to sell an ordinary library. Everybody has an idea of what to find in a library: books, CDs, DVDs, and magazines. By becoming a member of the Calgary Public Library you can avail of these typical resources and more unusual ways of learning. This is how fortunate Calgarians are and newcomers who really have to take advantage of this opportunity. But before you can have access to all of the resources for free, you must first get your Calgary Public Library Card. For only $ 12.00 (for adult) you can borrow various materials for the whole year. Go to any Calgary Public libraries and bring all the requirements and the fee. Update: Calgary Public Library membership is FREE. You can have your new library card in just a few minutes. In my opinion, the easiest way and most accessible place is the The Central Library in downtown just in front of the C-Train City Hall Station. You can borrow 99 items, a very generous offer nobody can refuse, If only we have all the time in the world. Tip: Whenever you have a problem using your card or in your account, don’t hesitate to send an email. I did so a few times already and the staffs always promptly respond and fix the problem. 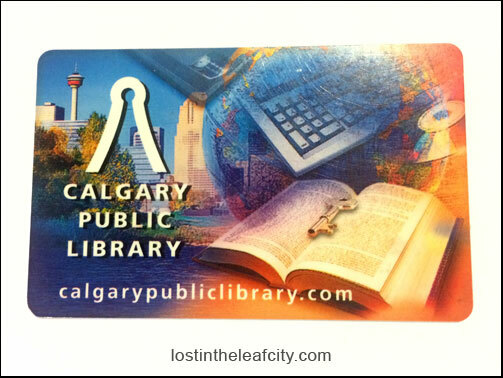 With your new card, you are fortunate to avail all the limitless benefits of indulging in the Calgary Public Library. I don’t want to overwhelm you further because I know you are already, every time you enter the library. So I would discuss only the online resources that some fail to notice or just unaware of the other benefits of becoming a member. I wouldn’t go into details. I’ll leave it up to you in discovering which fits your need and liking. You can try all or just a few. Calgary Public Library Program. This one is an exception. You do have to go online to start with. Anybody can attend any free programs offered by the library. First you have to get a copy of Adult Program Guide or Kids And Teens Program Guide in any library or download online. Choose a program and click register. Proceed with the instructions. You can choose to be reminded of the program through e-mail. Tip: You can view all the programs wherein you have registered by clicking “My Classes” on the right middle side of the register program page. Sign in and print all the classes so as not to forget any. And if you can’t make it, do cancel for others who are in the waiting list so they can take your spot. If you sign in through “My Account” you can only view the current status of your account: personal information, checkouts, holds, and fines. Now, let’s move on to some of the plethora of online resources. 1. Calgary Public Library E-Library: In the e-library you can browse and borrow audiobooks and ebooks, access huge collection of database and more. I can only emphasize the following links for all who frequently use smartphone and e-readers. Feel free, though, to scour the rest of the database. Freading allows you to borrow e-books (ePUB and PDF) using token for a limited time. Overdrive, on the other hand, permits any card holder to borrow audiobooks as well. Note: Read the “getting started” for freading and overdrive to see how you can borrow and install the necessary applications and software. To fully maximize the accessibility, download the software for your PC, iPhone, android, and e-reader. By installing the software and applications, I’m sure you can finish reading or listening in no time the borrowed item. I often read in my iPhone since I have it with me all the time. I don’t mind reading in small fonts which I can zoom anyway. So far, it’s hard to remember how many e-books I have finished using this tactic (or torture). You too, can read the book you’ve been longing to read, for free. If you cannot find the book through the Calgary Public Library catalogue, don’t fret. Try searching in Freading or Overdrive. 2. Newcomers to Canada: Are you a newcomer? Do not miss this page wherein you can learn about settlement services, English as a second language, and citizenship. 3. Job and Career Accelerator: For all job hunters, especially for newcomers looking for a job, this cannot be overlooked. Create an account so as to learn the occupation profiles, to look for jobs and internships, and to create Canadian resume and cover letter. 4. PressReader: Don’t be left behind. Read newspapers across the globe. Newcomers must remain informed of the happenings in one’s homeland and, if preferred, from other countries as well: 2,200 newspapers from 97 countries in 54 languauges. 5. Early World of Learning: Kids love learning online. Although there are computers for kids in libraries wouldn’t it be nice to learn at home with the help of mom and dad. 6. ed2go: Are you familiar with massive open online course (MOOC)? Simply put, you can study an online course and receive certification or otherwise depending on the program. Ed2go is similar to Coursera, Lynda (FREE) and Udemy (among the MOOCs) making distance education possible and accessible to anybody who has Internet access. The Calgary Public Library has mobile applications for iPhone and Android. Anywhere, anytime you can borrow and renew materials from the library, read ebooks, and listen to audiobooks. I have three mobile applications installed in my iPhone. Among the apps, I often use the Calgary Public Library iOS app to borrow learning resources. Renew the item if you can’t return them on time. Pay the fine fees. You can pay (cash, debit, and credit) at any libraries or online. It is one of the reason to always have coins with you. Writing this post is exhausting. I’ve ended up to various links—information overload. Nonetheless, it is worthwhile. If this what it takes to encourage a curious, lost newcomer to get a Calgary Public Library card and use it to the fullest potential, then, so be it. If you have the time, drop by to the library. Otherwise, find time to attend programs for Newcomers to Canada. Fill your newcomer-life book with knowledge you’ve learned from good and bad experiences, and especially from the library wherein you discover new hobbies, skills, and tips. I have many regrets in ignoring the opportunity to learn new things. Don’t go through that same experience. Now is your chance. The rest of the pages are unwritten. Make it colourful and informative. Which part of the library section do you frequent the most? Share your story of discovering new things and even how you locate your favourite library.